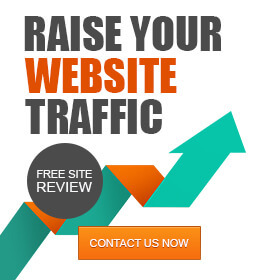 Conversion Rate is calculated depending on the case scenario of our website. For example, if the desired action is to complete a form we divide the number of people that successfully registered the form by the number of unique visitors that page had. Usually the term refers to ad clicks and it’s calculated by dividing the total number of conversions by the total number of ad clicks that were tracked. 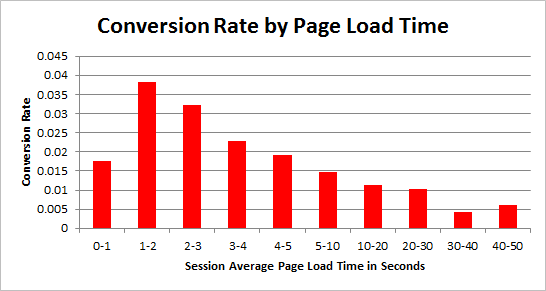 7 Poor Conversion Rate on Mobile – Why does this happen? Having a beautifully crafted website, good prices with carefully picked products is not enough. In order for sales to reach maximum efficiency, you need to know what your customers are searching for and what do they expect as buying options. A better understanding of your customers can be acquired through customer surveys as a post-sale service and direct chat interactions. Be sure you are presenting the best-selling products and the trend-setting items for your niche on the homepage that can ensure a quick visitor engagement when landing on your store’s homepage. This decision will have a direct impact on lowering the Bounce Rate, considerably reducing it. Also make sure that the best-selling products have an information-rich product description and the product picture quality is best. Always make sure to offer more than a single payment option, you can integrate payment with Paypal, Cash on Delivery, payment by Credit Card, Checks, Western Union, Money Gram, Escrow etc. Be sure you write down a text snippet with a short description on you homepage that will also reinforce your USP – include reasons why should a customer buy from your shop, your short storyline and other interesting details you could offer your customers about your business value. If you have a fantastic product to sell be sure to reinforce your USP with a great product video or video review of that product. If you acquire international traffic and you can ship products worldwide, a notification pop-up based on visitor’s IP Geo-Location would be advised in order to notify that customer that you are currently shipping to his country of residence. This is where you grab people’s attention for clicking on the CTA. 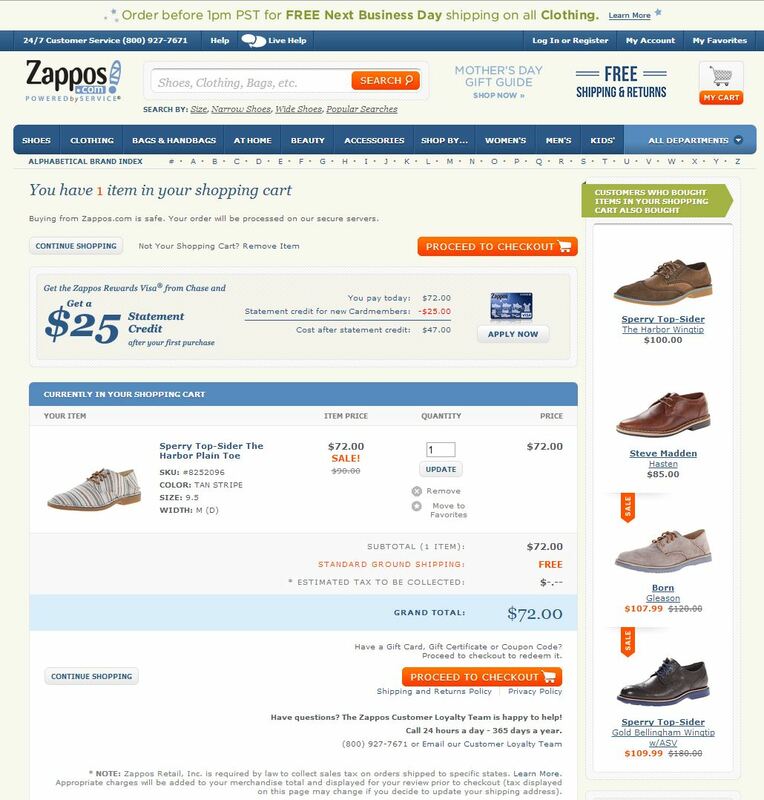 This page is mainly important because the first conversion step begins here and continues on the cart and checkout pages. Get high-quality product images (minimum 800px resolution) and remember to optimize them for the “alt” and “title” attributes. Also, consider choosing descriptive filenames for the product images. These would be the basics of a good on-page SEO for images. Remember to use keywords in filename, alt tag and title tag of the product images. Based on the fact that the search algorithm for Google Images is less complicated and works within primary on-page SEO ranking factors and less on backlink signals, this could be a great opportunity to increase your organic traffic with less effort. Take in consideration the search relevance of the page where the image is shown, Google’s algorithm scans for keywords in the text surrounding the image. Also, the image caption is a great opportunity to describe what is shown in the image, taking in consideration keyword inclusion. 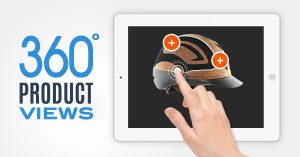 Product image size seems to affect the value perception of the product. If you sell a design oriented product (experience goods), like fashion items (a shirt), it was tested that more white spaces on the page minimized visual complexity and bigger pictures mean a less expensive perception of the product value. 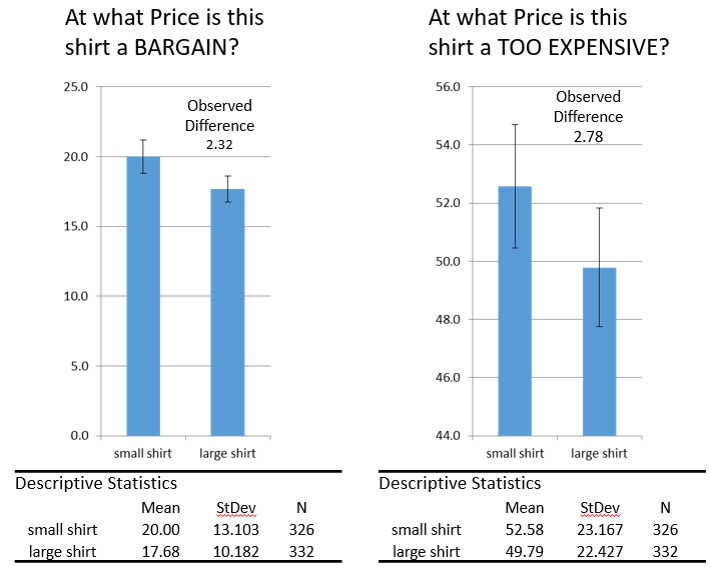 If your store sells search goods like technology – products whose features, charateristics, and overall value can be evaluated before purchase, larger images determined a higher perception of the product price value. Ben Labay from Conversion XL did a very fine research on this matter and you can read more here about it. Your product page represents a great SEO opportunity. Writing a useful, detailed-rich and keyword oriented description could mean a lot of search engine organic traffic entering your website for your product pages. Avoid using scrapped product descriptions from other sources on the internet or importing through data feeds short supplier generated product descriptions. Also here you can link out helpful information like product size charts, return policy or shipping information. Product images carry a lot of importance especially in some retail niches, like fashion, where an eye for details is essential. Also, a high-zoom function is useful for those type of customers picky on details. Larger e-shops use services like webrotate360.com that offers interactive 3D CAD & 360° Angle Product Photography for products. Also this functionality can be acquired through plugins depending on your Content Management System. There are some plugins for WordPress that do a great job integrating 360 product views with Woocommerce. Product page functionalities – size charts, size calculators, color eyedrop picker, smart product suggestions. Also, some fashion retailers use suggested related products in order for the customer to buy the whole look. So for example, if you are selling shoes and t-shirts you could filter the product related suggestions to output products for the same brand. If the customer is loyal to that brand it’s a better chance of converting him to buy more than 1 product. In most cases, customers are keen to know the exact delivery date of their products. Since it’s hard to predict an exact delivery date, big e-shops like Amazon use delivery time ranges of 1-2 days. If a product isn’t available anymore or there is a stock limitation on product acquisition, don’t delete the product page (avoiding 404 pages), rather set an “out of stock notification” clearly stated on page. If you have some information regarding the product restocking date it would be nice for the customer to know when it’ll be restocked. Also you can prompt an e-mail form, guiding the visitor to enter his e-mail so that he can be notified when the product will re-enter stock. The add to cart button needs to differentiate itself from the other navigational buttons on the website and it needs an eye-spotting color. A good color guide for the CTA buttons was written on Optinmonster’s blog and can be found here. Colors are directly linked to the psychological state of the visitor so please be advised to use A/B testing when implementing changes. Most e-commerce CMS’s come with this predefined functionality, helping the user for an easier navigation through category, subcategory and product pages. These links also helps the search engine spider to a better understanding of the internal link architecture of the website. When your adding or removing information blocks from your product or category pages pay attention to the overall structure to have a logical reading flow, also try including keywords as higher as possible on the HTML page. For example, on the category pages, you can add a short keyword rich description for that specific category. The information should be structured in orderly blocks that fit together as a whole (try avoiding blank spaces on product pages). Try reducing the number of categories or subcategories as much as possible. Use buying intent keywords for category names. Order categories properly. For example, if you are selling handbags, belts, scarves and wallets don’t create 4 different main categories. Instead, create a single main category named “Bags & Accessories” and try to include the subset in sub-categories for “Bags & Accessories”. Take into consideration that the fewer click options you give the visitor on categories, the bigger the chance for him to find what he’s looking for. Category names should be picked as close as possible to the user’s natural search intent language (check with website internal product searches – to see what are the customers searching for on your shop). The category order should be matched with product type popularity for your niche. There isn’t much to say about the SEO-perspective of the logo, but the tagline (small text under the logo – in most cases) should be short, descriptive for your business and include main project keywords. Also, keep in mind that you can use this tagline to reinforce your Unique Selling Preposition (USP) here. Your search bar can represent the first step the visitor takes upon starting his conversion journey. This box is so special you have to do A/B testing on form color, sizes, shape in order to see what works best on your niche. Avoid returning “no result pages” – if a query doesn’t return the expected output be sure to offer related product recommendations. 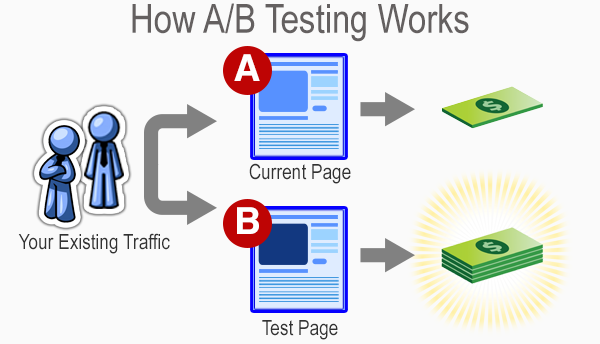 In most cases optimizing this page should be the incipient of the CRO process because it’s the final step in the conversion funnel. Optimizing this page should require less programmatic effort and maximum efficiency in ROI. Your checkout page’s fields should be clearly stated as being optional or mandatory. Also for an easier and a faster completion time you should use automatic autofill where possible (zip code, city). User errors in form completion (must be outputted next to the error field – not down the page) shouldn’t be a breaking step in the checkout process, you should let the user know where he’s made a mistake and allow him to continue down the checkout funnel (let users force proceed on checkout process). Also make sure you have the options of guest checkout or checkout with Facebook Connect available for the page. The account registration should be set on optional and by default the customer should checkout with Guest Checkout. (try avoiding as much as possible the requests for data input on the checkout page ). If the customers chooses to create a new account be sure to make the Newsletter opt-in automatically. The password selection for the create account button shouldn’t place limitations like the use of special characters or capitalizing the first letter, it’s good for security but it slows down the checkout process. Also make sure you have clear CTA’s on this page (“Continue to next step” button or “Place order” button). Also keep in mind that the “Place Order” button is the most important CTA on this page so make sure it stands out on the page. The process steps should be treated as navigational links on the checkout process. The form field for card data input would be nice to have a separator for the 12 digit card account number and a limit of 12 chars input in order to guide the customers for a faster credit card data input. If your webshop works with its own stock or you can give specific information regarding the delivery times, you can allow the visitor to pick and choose on a calendar selector located on the checkout page the exact delivery time of its order. 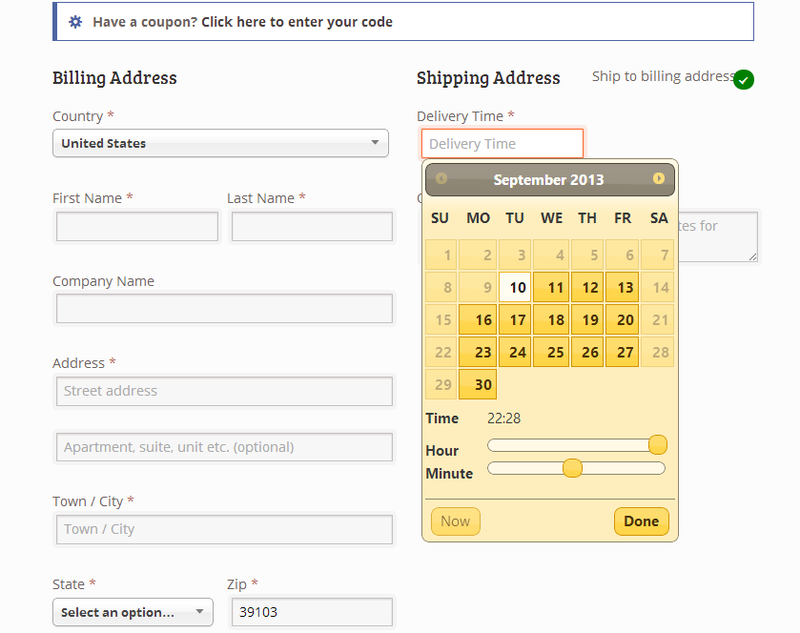 Picture above is a snippet of Delivery Time Picker for Shipping for Woocommerce which can be found on Codecanyon with 29$. After the order is placed, show an information rich thank you page that contains contact data or details about delivery times and special offers you currently have running. Although mobile traffic retains a growing slice of total website traffic – 32% of overall traffic, the revenue that comes from mobile is just 16% while desktop traffic represents 59% of traffic and generates 75% of the total website revenue. Poor Conversion Rate on Mobile – Why does this happen? 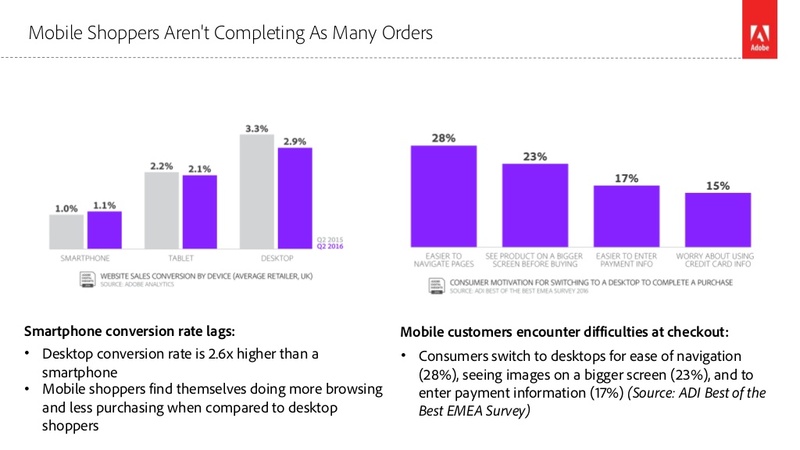 Benchmark your metrics against the retail industry/your niche to understand your results with a nice slice of context. Users will scroll down if what they see above the fold interests them enough to keep them reading. Back in the glory days of newspapers, the fold played a crucial role in grabbing the attention of viewers in order to encourage them to purchase the paper. Bold headlines and eye-catching images bombarded readers to pique their interest. This concept transitioned into web design, where designers make sure to place important information and imagery above the fold.